Super atmosphere !!! The beer is very good, and also the food is great. Nice people here in Merkendorf. Thre`s also the "Biergarten" of Brewery Hummel called "Hummelskeller". There you can sit in summer under shady trees and enjoy a cold fresh beer when it is hot. 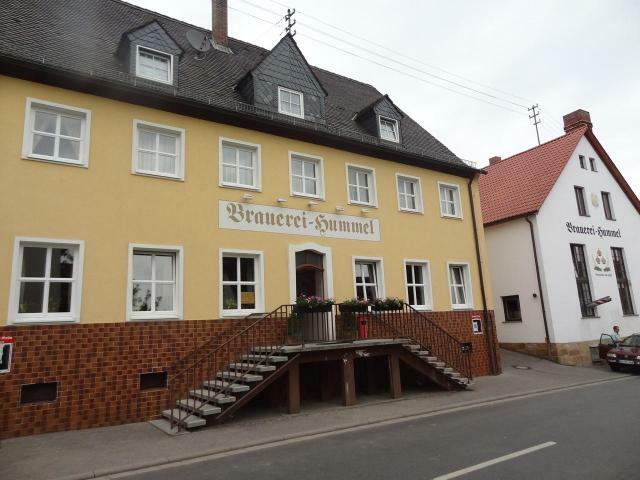 If you like the traditional Franconian taste, this is the place in Merkendorf. Some beers outstanding, some less so. on of the best beers I ever drunk. There are 9 different sorts of beer (some seasonal). Great atmosphere, great service and the food is fantastic. The prices are very cheap for this quality. 1 Beer 0,5l costs 1,60 (wow !!!) I´ll come back again. Hummel-Bräu Merkendorfer Räucherla: Full amber color and a nice rich smoky aroma as per style. A balanced malty/smoky start gains even greater smoky character toward the finish, with decent balance between malt and hops. Only the presence of a slight sourness in the body detracts from this otherwise very enjoyable brew. This place is a real gem in the Franconian countryside. The brewer here is really having fun, and it shows. He had 10 available beers when we visited! This is particularly impressive when you consider the fact that most breweries around these parts are in the 1-4 beers range. Moreover, these beers were all at least decent, but in some cases brilliant. The 5 on tap were all clean and flavorful, the Pils being my favorite. Of the 5 bottled (which I brought back home), the Räucherator (smoked doppelbock) is the definite knockout imho, a truly complex, scrumptious, and never exaggerating lager. The place has your typical Franconian countryside decor, so a small room with long, wooden tables, and a group of old men playing cards. Classic. Check these guys out, theyre only a few kilometers from Bamberg. -A languid foam shield reigns atop the royal ruby red. -A richly tapestried perfume projects salty red meats, earthy smoke, and therapeutic berry fruitiness. -An expertly designed body of wealth and nourishment offers all of the flavors portrayed in the aroma, and then some. -Wooden hop bitterness splendidly supports the generous maltiness. -A superb smoked doppelbock, never excessive, but never timid, an object of beauty. -Next time Im in Merkendorf, Im buying a lot more than a couple bottles. -Wealth reaches the nose in the form of hay, bread, and fresh cereals. -Pretty lacing hangs above the scant head and clear golden gown. -Huggable mouthfeels are intrinsic to Franconia apparently. -Earthy, wooden, and grassy hops meld into a doughy, bitter finale. -A sheet of foam protects the clear, orange gown, drawing bubbly lacing. -Bready, toasted maltiness evokes that of a wealthy pils. -Wooden hops, pils malt, and orangey fruitiness converse in friendly tones. -The body is rich, yet drinkable, a Franconian standard. -Willful, supporting herbal hops convey ample bitterness. -A ring of head circles the clear copper/amber. -A whispering fruity smoke makes up a diplomatic aroma. -Flavor presents stronger smoke, and may be compared to Spezials levels of smokiness. -Earthiness closes the glass, along with drops of water. -A ring of head surrounds the clear golden. -Aroma is bland for a maibock, a few more hops or honeyed malts would have been nice. -Hay and honey do appear in the flavor profile, thankfully, ably balanced to an earthy hoppy bitterness. -The soft effervescence is comfortable, and the malts know how to take advantage of this fact. -A decent maibock hell, but Klosterbräu makes a much more enticing example, imho. -A shy aroma proposes earthy hops and passionfruit. -Earthy, wooden hops are tame for the style, I was expecting a little more hoppiness than the Pils, admittedly. -The natural carbonation builds another stupendous mouthfeel. -Bitterness is weak, this one is more about the malts structure than most kellerbiers Ive had. -Some tartness escapes the nose in the form of citrus fruit. -Funky flavors whirl around the banana esters, leading to light tartness again. I paid a visit to the Brauerei Hummel on 3 Kings Day and really enjoyed myself. Good food, good service and great Bier. I bought a case of the Bock to bring home with me...enough said. More restaurant-orientated than it's neighboring brewery pub. But the beers are excellent and I left wishing I had more time to try them all. About 5 beers on tap and 6 in bottles! The Raeucherla was a lovely smoked marzen that I could had spent all day drinking. Highly recommended. My favorite place to stop for lunch just outside Bamberg. Good food, a consistently high quality selection of beers. With so many small breweries going out of business, I draw solace from the fact that Merkendorf can still support two great breweries. A few of us did a walk in the area on a Friday afternoon in January and stopped here (and a few other places). A pretty big selection of beers -- all that we had were enjoyable. Did not have any food here. Traditional atmosphere with plenty of locals. Which number is lowest 84 or 70?